Bolton rider Malachi Mitchell-Thomas clinched three wins at the Mid Antrim 150 although he was pipped by Derek Shiels in the main Grand Final race. After his opening win on Friday, Mitchell-Thomas, 20, clinched another Supersport victory on Saturday before winning the Open Race. Ryan Farquhar won the Supertwins class on his KMR Kawasaki, with Mitchell-Thomas having to settle for second. Ballymena's Neil Kernohan won a 250cc race which had to be shortened. Former Supermoto rider Mitchel-Thomas won Friday night's Supersport 600 race run in wet conditions, from runner-up Michael Sweeney. Last year's Senior Manx Grand Prix winner also came home ahead of the Skerries man in Saturday's Supersport race. 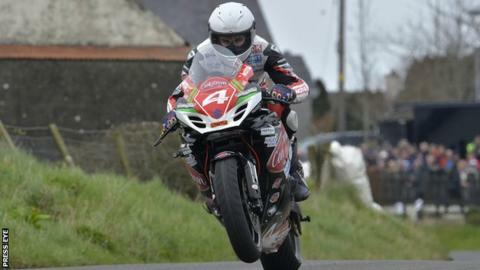 Riding for former racer John Burrows Cookstown BE Racing team, Mitchell-Thomas overhauled team-mate Sheils to clinch the Open race honours, with Sweeney third and early leader Ryan Farquhar fourth. The meeting was missing from the calendar in 2014 and 2015 because of financial limitations but returned as the first Irish road race of the new season. The Tandragee 100 will be held on 22-23 April, with the Cookstown 100 a week later.